Ex-undercover cop Marshall Grade is hiding out in New York City when he learns that federal agent Lucas Cohen has survived a kidnapping. Cohen was Marshall’s ticket into witness protection, and his captors have a simple question: where’s Marshall now? Marshall’s undercover work gave him a long list of enemies, and the enemy in this case is a corrupt businessman named Dexter Vine. Vine’s almost broke, in debt to people even worse than himself, and he wants to settle old scores while he has time. He’s hired Ludo Coltrane—a nonchalant psychopath and part-time bar manager—to find Marshall at any cost. Ludo’s no stranger to killing, but his associate, the cash-strapped ex-con Perry Rhodes, may prove more of a liability than an asset. The question is: what has Marshall done to make Dexter want him dead? And are the contacts from his old life—ex-colleague Lana, and the heroin dealer Henry Lee—prepared to help him, or will they just sell him out? Dark, violent, and grimy; the fifth tale fromBen Sanders shows the still-young Kiwi has really found his stride when it comes to action-packed, gritty noir. His second novel to star ex-undercover cop Marshall Grade, who lives on his own terms despite ostensibly being in federal witness protection, crackles with vengeful energy. Federal agent Lucas Cohen is grabbed while transporting a fugitive. But it’s not him the abductors want. It’s Marshall. When the former New York City cop, now lying low taking art classes in California after surviving a hit-man and other nasties in New Mexico, hears of Cohen’s ordeal, he decides offense is the best form of defense. 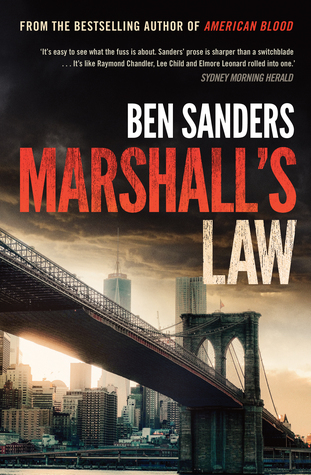 Marshall returns East, linking up with his former contacts in the drugs world – questionable characters on both sides of the law. The big question: who is hunting him, and why? There’s a real zing to Sanders’ writing. While his prose can be bone-dry, the marrow is rich. Violence abounds. 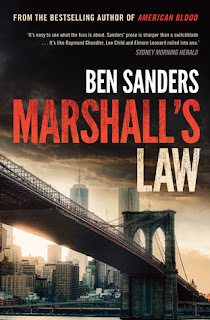 It would be too easy (and a little reductive) to call Marshall a Jack Reacher-like hero, but Sanders actually nods more towards Elmore Leonard in style. There’s a terrific filmic quality to Marshall’s Law, and you can easily imagine the Coen brothers or Quentin Tarantino helming a screen adaptation. There's a sense of poetry to the violence, a sense of philosophy mixed in with the grit. All powered along by a slickly told, cinematic story. Personally, I somewhat missed the Southwestern setting of American Blood, as for me that textured the tale and suited Marshall’s lone gunslinger persona even more, providing symbolism and interest, but this New York sojourn is still top-notch crime writing from a rising star. Well worth a read. Craig Sisterson is a lawyer turned features writer from New Zealand, now living in London. In recent years he’s interviewed hundreds of crime writers and talked about the genre on national radio, top podcasts, and onstage at festivals on three continents. He's been a judge of the Ned Kelly Awards, McIlvanney Prize, and is founder of the Ngaio Marsh Awards. You can heckle him on Twitter.